The morning after I brought Oliver home, he and I went to play in a meadow near my house at about 6:00 am. Neither of us had slept much, and we were both fairly shell-shocked by this new life we’d found ourselves in. Up trotted a neighbor, Fran, with her Schnauzer, Shocky. Shocky was Oliver’s first friend. I should also explain that I had lived in my neighborhood for two years already and had never met a neighbor. If you don’t garden or cut your lawn, or you don’t walk a dog, you really don’t see other people. Not enough to form relationships, at least. 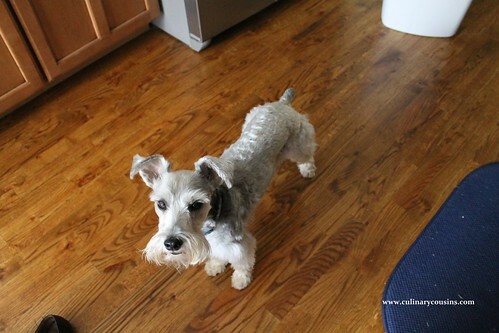 Once Oliver entered my life, we made friends far and wide, of both the human and canine variety. He makes my home feel so much more like home. We frequently ran into Fran and Shocky on our walks. Even though Shocky was 10 and Oliver just a wee babe, they would run and frolick together as much as their flexi-leashes would allow. It seemed like they knew they were cousins. Well, we lost Shocky last month, and I know Fran has been completely bereft. Anyone who thinks pets are just “pets” has never owned one. They are our children to a great extent, ones we have to face losing every 10 years or so. I saw a sticker on the back of a car this week that captured it perfectly for me: a paw print with the words, “Who rescued whom?” Exactly. When Fran told me about Shocky, she offered to take Oliver on her daily walk. I know she would enjoy the companionship, and Lord knows Oliver needs all the exercise and outlets for his energy we can get. So, I wanted to officially hand over my permission and express my condolences in the best way I know how — with baked goods. I relish a culinary adventure in the kitchen. Sometimes I like to make things just to see if I can do it, and biscotti has been on that list for awhile. It’s not a treat I eat or order regularly, but it’s a bit exotic and I knew making it can be complex. It’s a weekend project, since you have to bake the dough several times to achieve the ideal crispy texture. I stumbled on a recipe in a magazine recently, and noticed I already had all of the ingredients. So I was fully prepared when I heard Fran’s news — the perfect intersection of timing and opportunity. 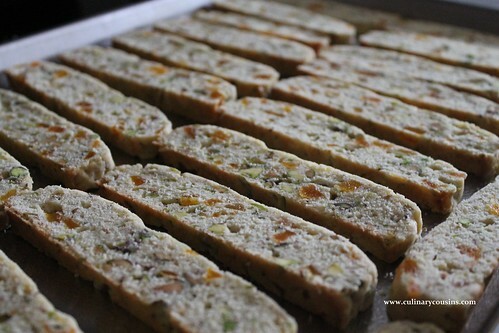 Making homemade biscotti was quite easy, though the baking and rebaking does take some time. 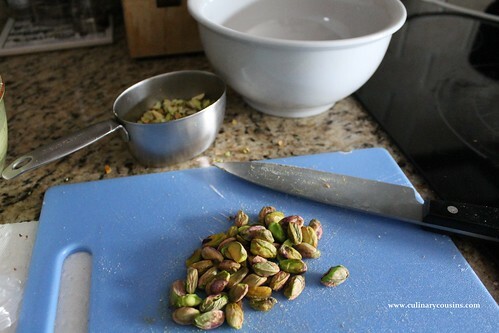 I would recommend, if you follow this recipe, that you buy shelled pistachios. Unshelling them felt like it took a year. Let’s just say that if I never have to separate a pistachio nut from its shell again, it will be too soon. The biscotti turned out beautifully, with a nice overall crunch and a little chewiness from the apricots. Neighborly and ceremoniously, I was able to share this batch and my little dog with Fran to help her through. RIP, Shocky. Oliver and I will miss you. Lightly spray a loaf pan with non-stick cooking spray, or grease it with some vegetable oil using a paper towel. Line a large baking sheet with parchment paper. Set both pans aside. Melt the butter in a small saucepan, then set aside to cool. Chop the apricots and pistachios, and set them aside. 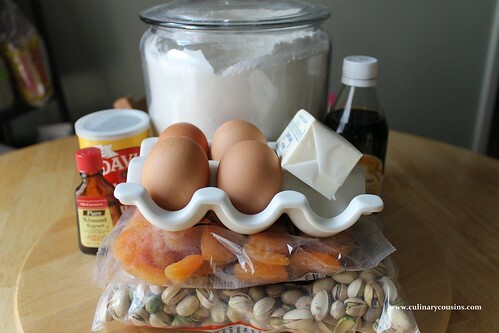 In a large mixing bowl, combine the sugar, melted butter, baking powder, vanilla extract, almond extract and salt. Stir together until mixed. Add the eggs and egg whites, and beat together until well combined. 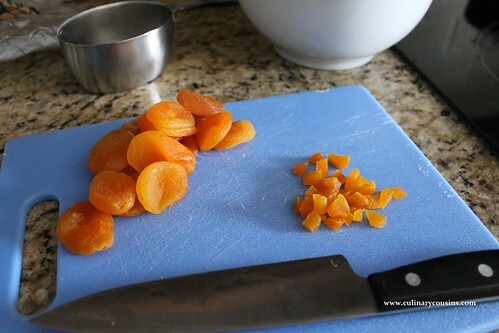 Fold in the apricots and nuts, mixing well. 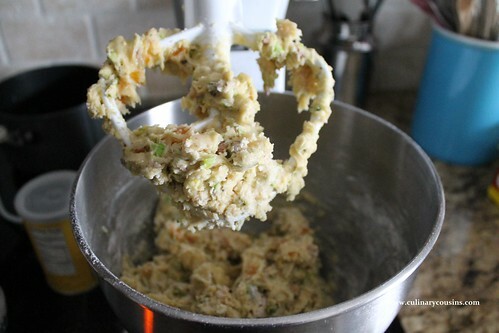 Gradually stir in the flour, a little bit at a time. Once the dough has come together, pour it out onto a cutting board. If it’s a little too sticky, let it stand for 5 minutes. If it’s still too wet, knead in a small amount of flour with your hands until it’s the consistency of firm cookie dough. 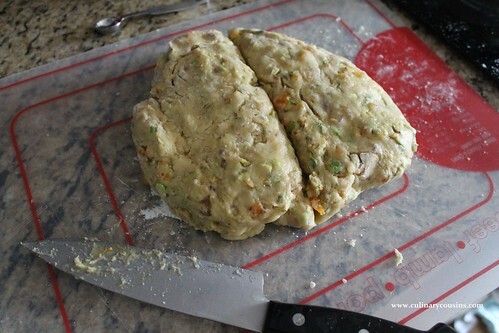 Shape the dough into a mound and cut it in half with a knife. Press one half of the dough into the greased loaf pan until it forms an evenly flat rectangle about 8 x 4 x 1 (or so) inches high. Turn the loaf pan upside down and catch the dough with your hand. 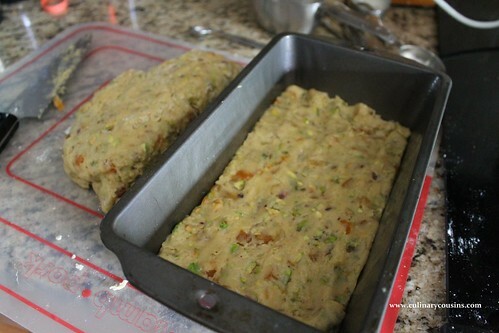 Carefully place the formed dough on one end of the baking sheet you lined with parchment. Grease or spray the loaf pan again and repeat with the other half of the dough. 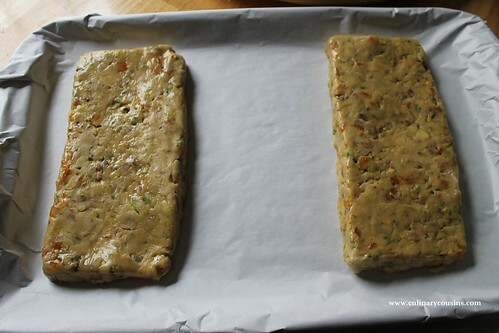 Place that formed dough on the other end of the baking sheet, so that the two rectangles are spaced as far apart as possible. Bake in the oven for 26-32 minutes, or until a toothpick inserted in the center comes out clean and the top is slightly golden. Remove from the oven and let the dough cool completely. Line two other baking sheets with parchment paper. Once cool, transfer one of the dough pieces at a time to a cutting board. 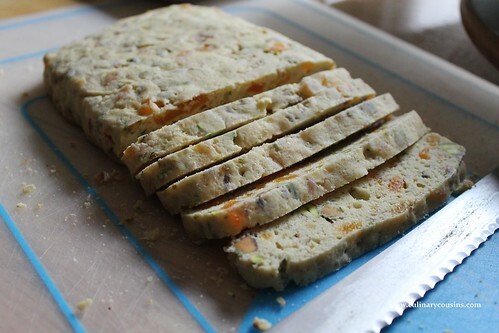 Using a serrated knife, carefully cut the loaf into slices about 1/4 inch thick. Place the slices cut side down on the baking sheet. Bake the slices in the oven for another 15 minutes, or until lightly browned. Remove the pans from the oven and let the slices cool slightly, about 10 minutes or so. Flip each slice over gently and bake another 8 minutes, until golden brown. Watch them carefully so they don’t get too brown. Leaving the sheets inside, turn off the oven. Let them sit in the closed oven for another 10 minutes so the biscotti can fully crisp. Remove the pans from the oven and let the biscotti cool completely. You could go one more step and dip the biscotti in chocolate — I think white chocolate would be lovely with this pistachio and apricot combo. Just dunk one cut side in melted chocolate and set on a piece of parchment or wax paper until set. 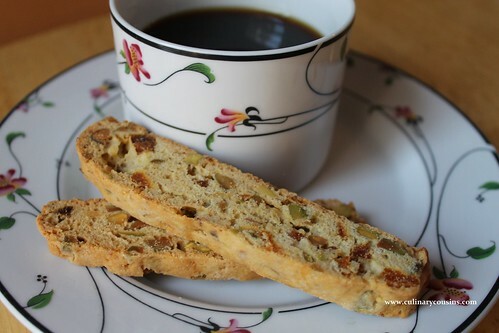 Enjoy the biscotti with coffee in the morning, as a snack or as an after-meal sweet. So sorry about the loss of Oliver’s friend, but what a kind gesture to share homemade biscotti along with fond memories of Shocky. And how clever to use a loaf pan to form your biscotti logs! I’ve always shaped them with my hands (often moistened to prevent sticking), but I end up with uneven shapes or weird end pieces that way. The loaf pan takes care of all that – I’m definitely trying it next time I make a batch. Aw, thanks Elisa. I wish I’d come up with the loaf pan idea, but that was in the magazine recipe. I’d give them credit if I could remember which one it was! It definitely keeps everything easy and uniform. Thinking of Shocky — and of Oliver, too! Oh, the loss of a friend. Never gets easier. 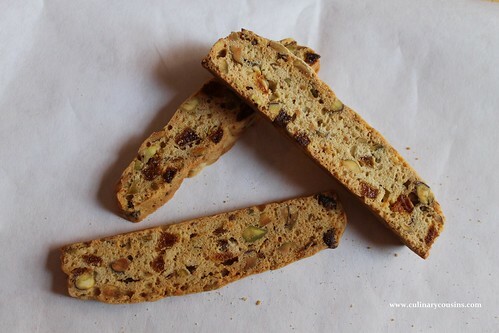 I’ve never tried my hand at biscotti, but it’s definitely intriguing! Love the sound of this one, and your photos are lovely. Hi, Meg! Thanks so much. Let me know how the biscotti goes! I know you’re being good until November, but it makes a nice, not-too-sweet treat when you need one.